Thirty to 40 per cent of Oromocto clients are retirees, and that’s because people retire without realizing they won't have enough savings to feed themselves and their families. Some food banks in the Fredericton area are seeing more customers than ever before. 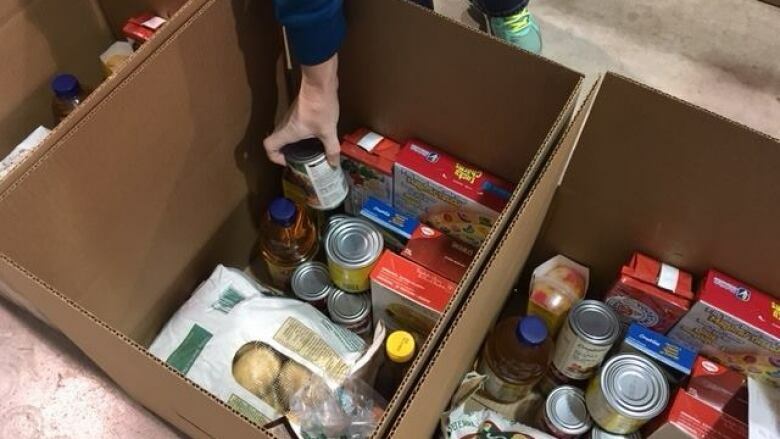 The Oromocto food bank has seen 800 more users in the last eight months, said Jane Buckley, the executive director of the charity and chair of District 3 of the New Brunswick Association of Food Banks. District 3 includes Chipman, Doaktown, Fredericton, Jemseg, Minto, Oromocto, McAdam, Stanley, Upper Tracy and Woodstock. The number of users is going down in rural areas, staying stable in cities such as Fredericton and going up in smaller centres such as Oromocto, Buckley said. "I've done a little bit of research on that and I attribute that to job loss, I attribute it to retirements, I attribute it to the mean senior age in the very rural areas," she said. "I attribute that to seniors coming out of the house and realizing that it's OK to get food. There's all kinds of reasons, marriage break-ups." She said among the clientele, 30 to 40 per cent are retirees, and that's because people retire and realize they don't have enough money left to feed themselves and their families. And to compensate for the increased number of food bank users, Buckley said, the organization reaches out to the public, including asking for donations to the Feed A Family Campaign. The campaign officially launched on Monday in partnership with CBC News. It's a fundraising drive that provides full Christmas dinners to food bank users. This year, there are 2,150 families in District 3 in need of help, making this year's goal $107,500. Last year, with the help of CBC listeners and readers, $117,000 was raised, taking care of Christmas dinner for 2,245 families. Buckley said the number of families is based on a Food Banks Canada count. She said the good news is that this year, 2,000 fewer families are struggling with hunger in the province, according to the count, and around 100 fewer in District 3. "But there's still a huge need," she said. About 18,000 families in New Brunswick stil can't afford enough food, and Christmas brings an average increase of 15 to 20 per cent of people using food banks because "Christmas is such an expensive" season, she said. Buckley said a big fundraising event for the district is a David Myles concert, which will take place on Dec. 10 at King's Place Mall in Fredericton. As well, the St. Paul's Church's advent carol service is this Wednesday. "[Fundraising] is crucial for the camaraderie of our society," she said. "Christmas is huge for families. It's a tradition. It's difficult for families that aren't able to provide that for their families. … The food is probably even bigger than the presents for a lot of these families."